Have any special needs? 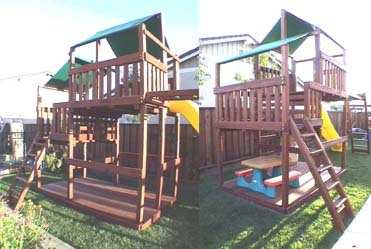 Or would you really like to personalize your backyard play area? This Frontier Fort has the upper-level rotated 90 degrees. Everything - including the deck boards with under carriage - has been rotated, with a perfect fit. The side of the fort has a new opening for the slide with an accompanying 'monkey bar add-on' running parallel to it. Our customer bought this kit before we had the 'clubhouse add-on', so he designed his own. As you can see, the floor and part of the wall framing has already been installed. This 5' x 5' Discovery Fort fort needed to fit in a tight spot. He reduced one side (left picture) to 4', relocated the ladder to this side, then designed his own wood roof! 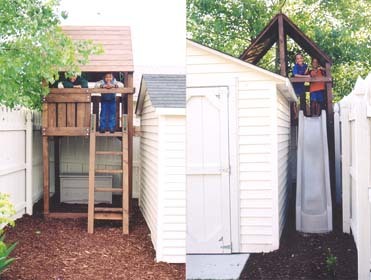 Both of these forts are perfect examples of how our playsets' simple construction and modular design allows someone to modify any playset to fit their needs. One of these customers made all changes himself, without our help. The other called us a few times and we were more than happy to walk him through it.